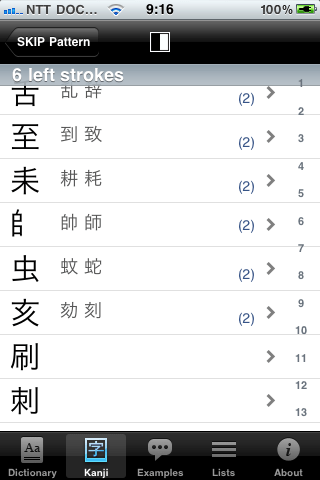 Now, I select the second component of the kanji, and Kotoba! 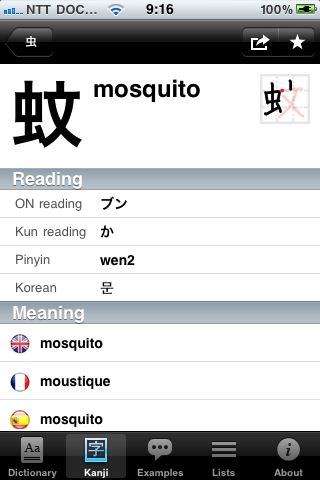 tells me this is mosquito (and the stroke order, and how it’s pronounced. Huzzah! Arigatou gozaimasu, Kotoba! 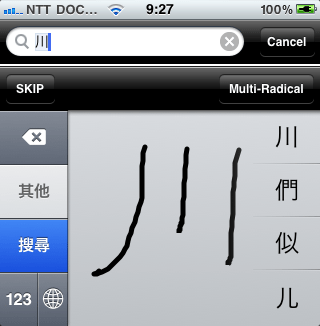 You can also look up kanji by radical (root), but I haven’t had as much luck with that as I’ve with the previous two methods. Japan is suddenly a lot less daunting when you can read more of the surrounding signs. Tokyo’s still humid beyond belief, and because I’m a glutton for punishment, I’m going down to the Shiga Prefecture (滋賀県) in the Kansai region this weekend where it’s even warmer for an MIT-Japan alumni/intern retreat. In lieu of more pictures today, here’s a photo from the grocery store here in Kokubunji. It’s what it says on the tin, really. This entry was posted in Japan, languages, travels and tagged Japanese, kanji, Kotoba!, maps, mosquitoes, nattō, spam, sushi by sondy. Bookmark the permalink.